The first stone of today‘s “Rosa Alpina” was laid in 1850 when from the donation made by a prosperous family from San Cassiano to the Church, a „Vidum“, a parish priest house, was built. Since the very beginning the parishioners were running in that house a small restaurant, an inn and some rooms for the guests. At that time San Cassiano counted little more than 100 inhabitants and the village was made of the church, the priest house, the school, the sexton‘s house and about ten huts spread in the mountains. Between 1915-1919, San Cassiano played an important role during the First World War. It represented the last Austrian bastion before the front and therefore all provisioning for the Emperor’s troops had to pass through San Cassiano. People fought till the end, in a trench war, for the front line traced on the mountains of the Valparola Pass. The „Alpenrose“ parish church - hotel, the only public place in the village, was in those years an important meeting point for soldiers and officers and also the centre for all social events. In 1920, after the WWI the name „Alpenrose“ was replaced by the Italian „Rosa Alpina“. In the ‘30s tourism increased a lot: some farmers restored their farms building up some more rooms for renting them to the guests. The first development of the tourism in the area was arrested in 1939 by the Second World War. The villages in South Tyrol became smaller due to the “Option”, an agreement between Hitler and Mussolini, which put the South Tyrolean people in front of the difficult decision to remain in their homes which meant to agree with the Italianization of the area or to leave for another area out of South Tyrol. So, one part of the population decided to move to Germany and Austria, while many others had to migrate elsewhere. The pasture huts which had been abandoned were purchased by an authority similar to a state office and then sold again. In 1939, also the Schifferegger Family moved to Austria and Engelbert Pizzinini, who already owned the Teresa Hotel, decided to take for rent from the state office the Rosa Alpina. Engelbert Pizzinini purchased the farmhouse and the lands. In 1950 the tourism industry was growing again, even though the summer season was only limited to August and the winter season to Christmas and Easter. In that period there was only one narrow country road connecting San Cassiano to the rest of the world. In winter, foreigners had to be taken from the post house in La Villa to the Rosa Alpina Hotel on some horse sleds. 1952: installation in the Rosa Alpina Hotel of the first telephone, derived from the phone office in Corvara, its phone number is 1. In 1955 the hotel underwent the first important renewal, 20 more beds were added. The road to San Cassiano was widened. In 1956 Erich Kostner built the first ski lift in Corvara, economic development in this region couldn’t be arrested anymore. 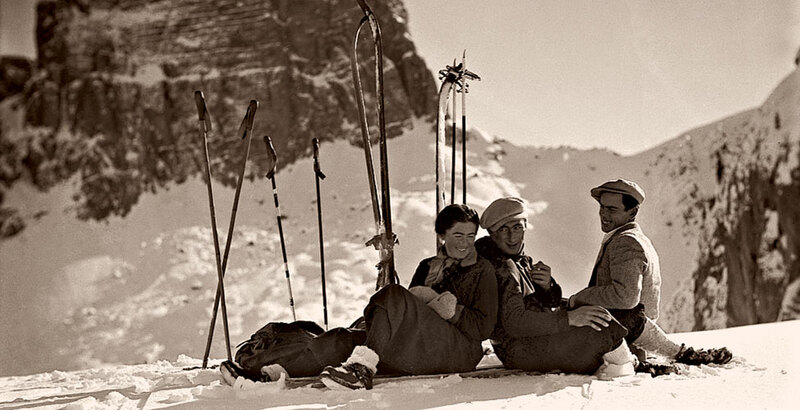 In 1957, the Pizzininis built the first ski lift in San Cassiano, 150 meters long. At the Rosa Alpina live music was played for the guests for the first time. In 1959 a second long ski lift was built (300 m long). 20 more beds were added in the Hotel. Engelbert Pizzinini built his second power plant, increasing electric power from 12 kW to 90 kW. In 1960, following an accident, the Pizzininis gave up the ski lift activity. 1961: building of the chairlift to the Piz Sorega. From this moment on both the village and the Rosa Alpina Hotel kept on growing. 1963: building in the same house of the first food and sport shop in San Cassiano. 1966: opening of the „Taverna“, the first ball room for 200 people. In 1968, Engelbert Pizzinini presented to his eighth born child Paolo the Rosa Alpina Hotel. In the same year he got married with Miss Ulrike Frontull from La Villa. Four children were born: Barbara, Marlene, Michael (died after the birth) and Hugo. In 1970, after a further renovation, the Rosa Alpina Hotel became a three star Hotel. In 1977 the stables were transformed in the Apparthotel Rosa Alpina. Since 1979, the Rosa Alpina Hotel also hosted the San Cassiano post office. In 1980 the capacity of the two power plants was increased to 420 kW. From that moment San Cassiano was supplied with electricity almost the whole year round. In 1986 the Hotel underwent some further important renovations. The tavern was renewed and the lunch room was added together with the terrace, the Hotel counted then 160 beds. In 1987, after a serious disease, Mrs Ulrike Frontull, Paolo Pizzinini’s wife, died. In 1988 the house became a four star hotel. 1989, Paolo Pizzinini married Daniela Steiner. 1990: Sophy Pizzinini was born. In 1991 the Hotel hall and 20 rooms were renewed and made more suitable to the first category standard. 1994: Norbert Niederkofler joined the “team”. After having worked with the best cooks in the world, he came back to his roots and opened the St. Hubertus Restaurant inside the hotel. In 1996 the Apparthotel was connected to the hotel and the 25 apartments were turned into superior and suite rooms. In 1998 the Guest Room was renewed, taking the name „Stüa dal Pan“ and the hotel was promoted to 4 star S (superior) hotel. In 1998 the well-known company „Frette“ designed the Suite Frette. 1999 began the restauration of one of the huts owned by the Pizzinini family. 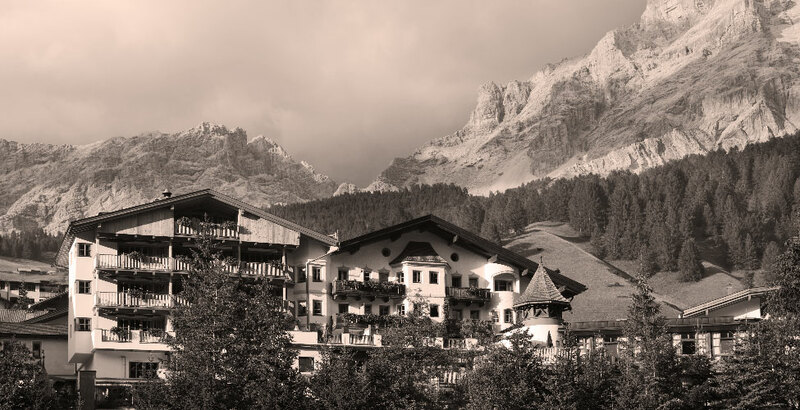 In 2000 the Hotel & Spa Rosa Alpina became a member of the association Relais & Châteaux. The St. Hubertus Restaurant got the first MICHELIN STAR. At the beginning of 2003 the Rosa Alpina Partyservice was founded. In March 2004 the Rosa Alpina organized the I. Chef’s Cup, an informal competition among chefs and wine producers. In April Hugo Pizzinini married Ursula Mahlknecht from Brunico. In March 2005 Prince Albert from Monaco stayed at the Rosa Alpina during the “I. Stars Ski Event”. In January 2006, 2nd edition of the Chef’s Cup. Michelin guide 2007: TWO MICHELIN STARS were referred to the St. Hubertus. January 2008: 3rd edition of the Chef’s Cup. The „Chalet Loft Suites“ in a wooden construction following the nature rules, had been constructed between Oct-Nov 2008. In October, Jacob Pizzinini was born, first child of Hugo and Ursula. End of 2008: opening of the Hug’s Bar, Rosa Alpina's Après Ski & Disco Bar, at the lift station of San Cassiano. Spring 2009: a terrace facing south was added with access from the lobby and the private garden. In February 2010, Rosa Alpina’s Beauty Spa got the Condé Nast Traveller Readers‘ Spa Award 2010 for the category “Best Hotel Spa in Europe, Asia Minor and Russian Federation”. The Restaurant St. Hubertus in the same year becomes member of “The Soste”, a renowned association of restaurants. In September 2012 the Rosa Alpina wins the “Food & Travel Readers Award 2012” as best international hotel. At the end of November Peter Pizzinini was born, second child of Hugo and Ursula. In October 2013 the Restaurant St. Hubertus becomes a member of Les Grandes Tables Du Monde. In 2014 Châlet Zeno is built above the Wine Bar & Grill. Spring 2015: birth of Nora Pizzinini, Hugo and Ursula‘s third child. Autumn 2015: construction of the new spa wing (for adults only) , the library, a billard room (furbished with the original wood panelling from Jepele Frontull‘s living room, Hugo Pizzinini‘s great-grandfather), a meeting room, a cinema for up to 12 people.